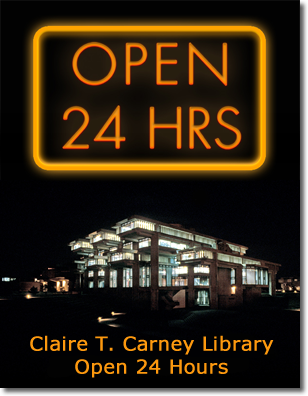 Claire T. Carney Library Open 24/7 Starting Sunday, November 30th! We hope you will find a variety of study spaces to choose from including our quiet study areas in the South Reading Room and Grand Reading Room, several group study rooms available by reservation, and many individual and group study areas throughout the building. The Campus Transportation Department will be providing Shuttle Service from the Library to Residential buildings from December 1 – 16. A continuous loop to and from the Library will be offered December 1 – 11 and then starting December 12 -16, “Safe Ride Shuttle Service” will be provided by calling to arrange a pick-up at the Library between the hours of 2am and 7am (Transportation Dispatcher 508-999-9175). For added convenience, residential and commuter students with cars may park in lots 13, 14, and 15 from 6pm to 6am during this time frame. Also, Dining Services will be available for extended hours at the Library Café until 12am beginning December 1 -11. * Extended hours are for members of the UMassD community only. Please have your UMass Pass with you as you ma be asked to present it during the overnight hours to verify eligibility for the extended hours. If you need to obtain a UMass Pass, please go to their office located on the ground floor of the campus center Monday – Friday 9 AM to 4 PM. This entry was posted in From the Dean of Library Services, General Library on November 25, 2014 by cmcneil.